Duchess Kate's Go-To Makeup Artist Has a New Beauty Line Now Available In The U.S.
Kate Middleton's glowing skin might have something to do with the whole living-in-a-palace thing, but beyond the loveliness of her general being, she's also got the world's best makeup artists and products at her disposal. The woman who supposedly taught the Duchess how to do her own makeup for her wedding day is Arabella Preston, and she's responsible for bringing us all a new opportunity to have a copy-Kate moment. 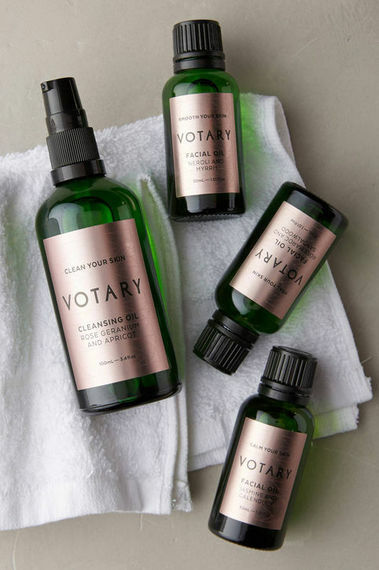 Her line of facial oils, Votary London, has just arrived stateside at Anthropologie! "I found that massaging a few drops of natural oil into a model's face before starting her make-up not only left the skin glowing and invigorated, but had the added benefit of relaxing and calming my client," she said. "I realized I had only used oils to remove my make-up and to moisturize for nearly two years, and my skin had never been happier or healthier." (Psst--when she says "model," we're totally subbing in the words "Kate Middleton," 'k?). Preston said it's the line's cleansing oil she finds herself recommending most often, believing it to be an antidote for skin problems caused by run-of-the-mill washes. "I believe a large majority of skin problems can be put down to dehydration, often caused by using foaming cleansers or products with man-made ingredients like mineral oil," she explained to us, saying she's seen better results with the oil. "It takes makeup off brilliantly, and instead of leaving skin dry and tight, leaves it soft, plumped and with its balance restored." Anthro currently stocks a cleansing oil, a toner, and three different blends of facial oil; prices range from $72 to $118, with the oils at $102. Pick your mix based on your needs (Jasmine and Calendula to use as makeup prep, Rose Maroc and Sandalwood as a rich hydrator and dullness-fighter, and Neroli and Myrrh as a general savior--"my go-to face oil. I take it everywhere, and it solves any problem"). In further Kate news: The royal went to work yesterday, giving us a chance to glimpse what she'd wear if she had to hit the office everyday. 8 Super-Easy Steps for Looking Flawless -- Fast!